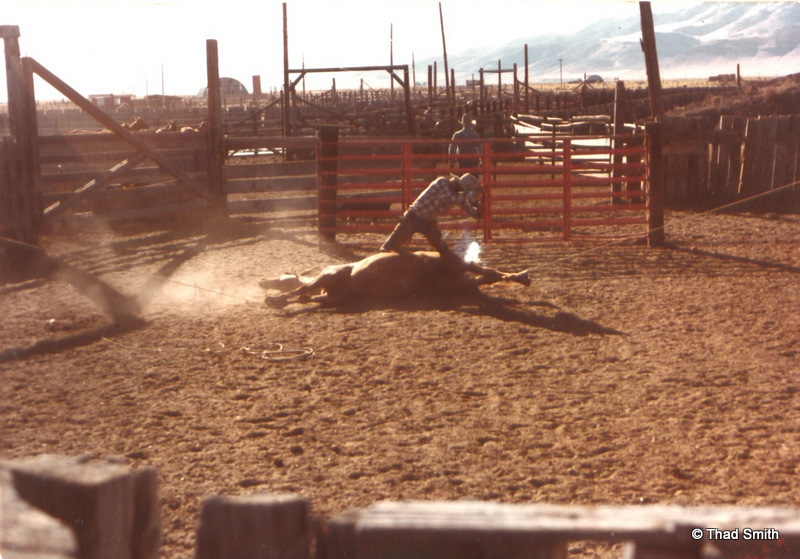 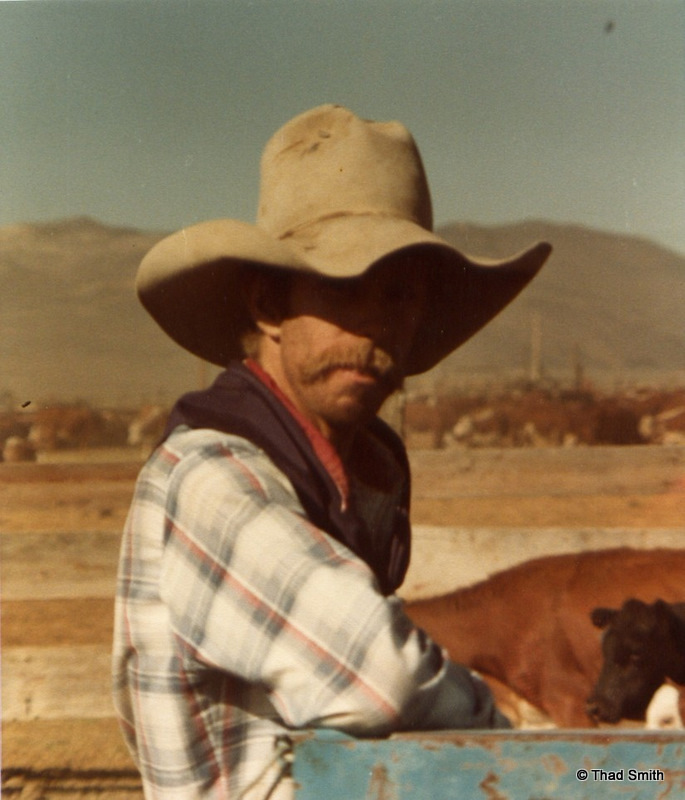 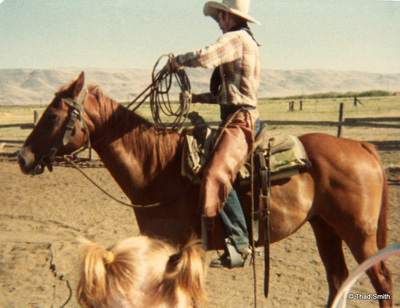 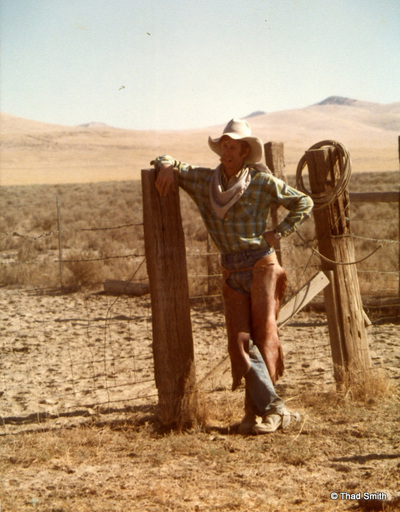 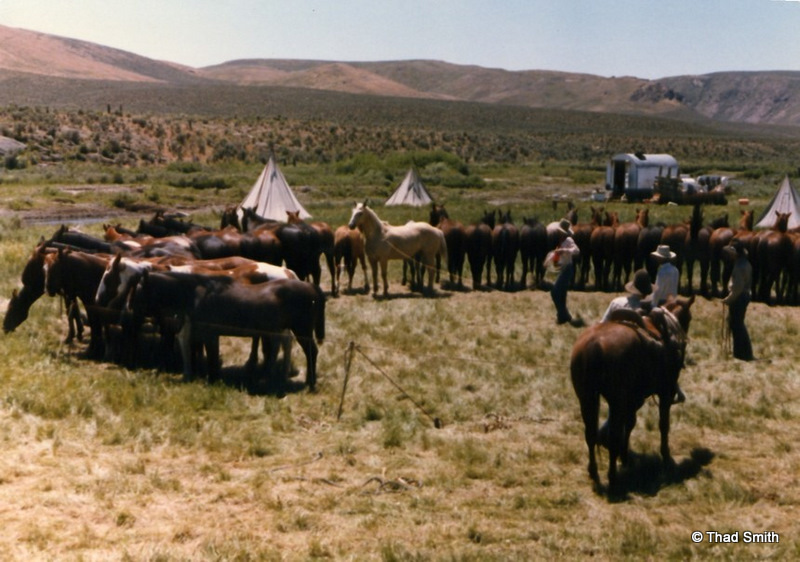 Thad Smith was the buckaroo boss on northern Nevada's TS Ranch in the 1970s and 80s. He contacted us with some historic photos that belong to him and said, "I would really like for them to be posted." The photos show some real authentic buckaroo history and we are proud to present them with a little of the ranch background. 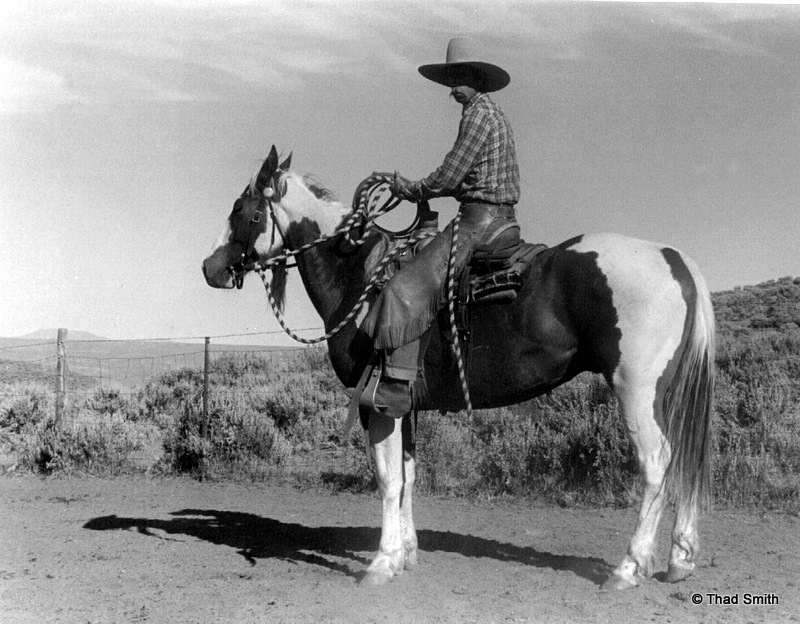 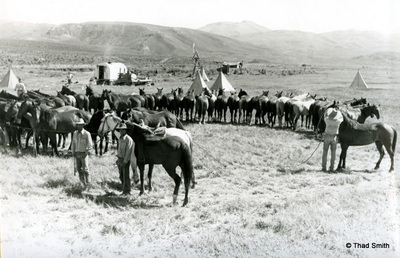 For another story on the TS Ranch see our article The Historic T Lazy S Ranch of Nevada. 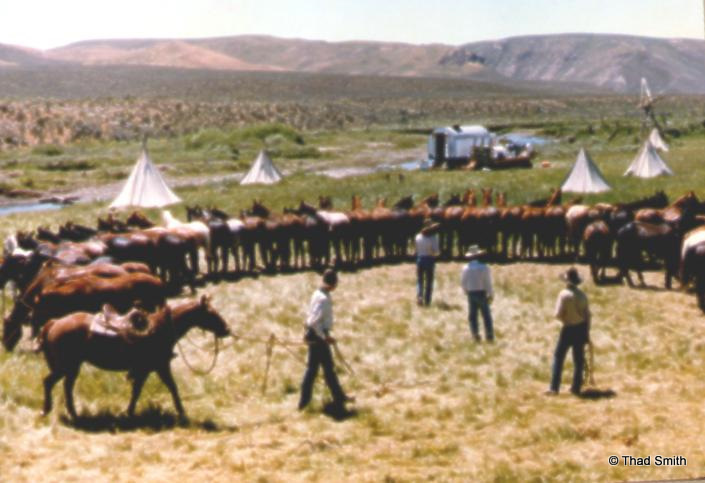 In those days, they ran a wagon on the TS, a ranch that stretches over 48 miles from headquarters to its most distant cowcamp at Coyote. Buckaroo boss Thad Smith and his crew of five buckaroos camped with the cattle for six or seven months to be close to their work of doctoring and branding cattle. 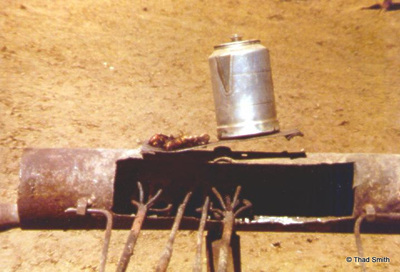 They had a cook wagon with a cook. 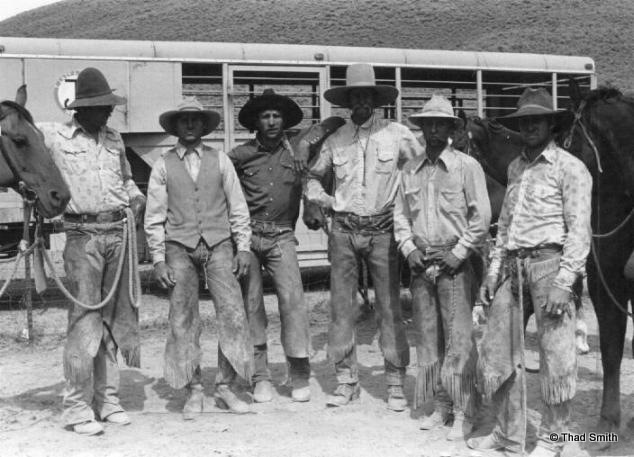 They arose early and worked long hours every day. 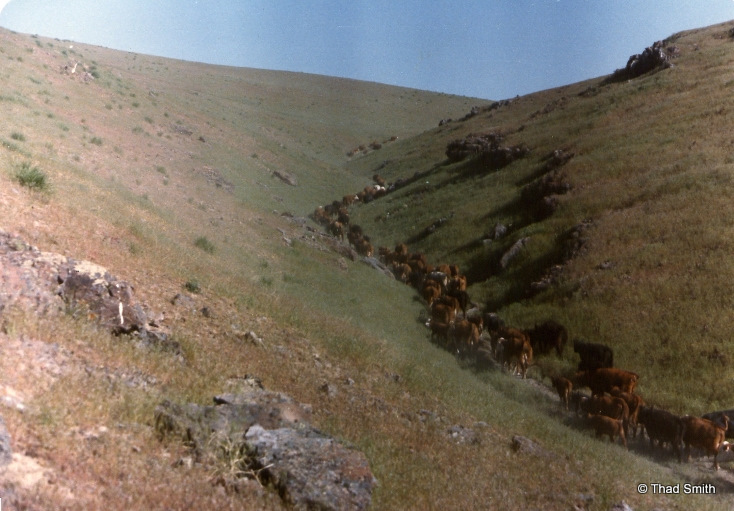 They had only a couple of days off during the summer. 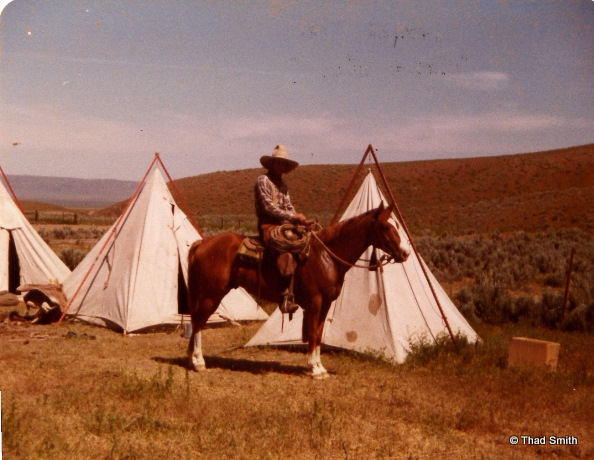 It was a hard life, but a fulfilling one. 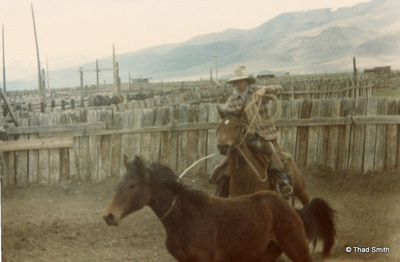 After leaving the TS, Thad and his family moved back to his home state of California and he became a full-time firefighter. 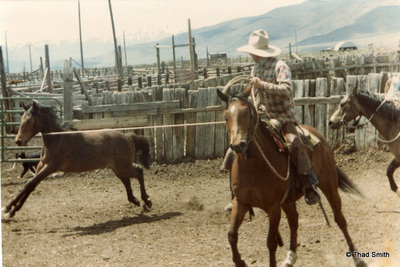 He has since retired as a Battalion Chief. 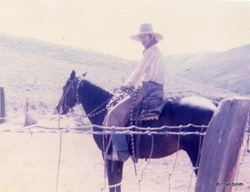 He says, "Life has been good to me...I have been a surfer from Southern Calif in my teens to a Marine in Viet Nam in 68 and 69 where I got shot 7 times and received 3 Purple Hearts.. then became a cowboy workin' feedlots in central California then a Buckaroo boss on the good ole TS ranch then a firefighter...YES Lee I have lived a very exciting life...I am 61 yrs young now and still raise a few head of cattle." 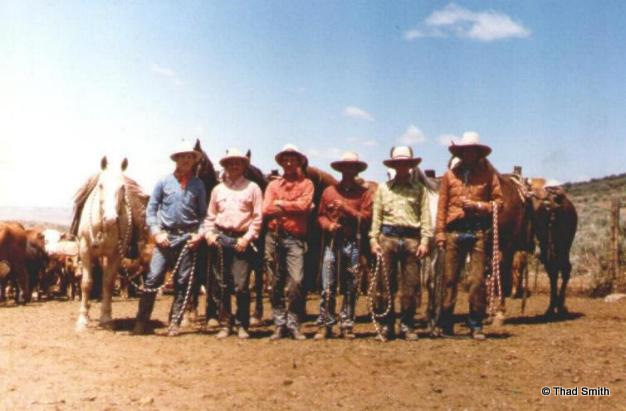 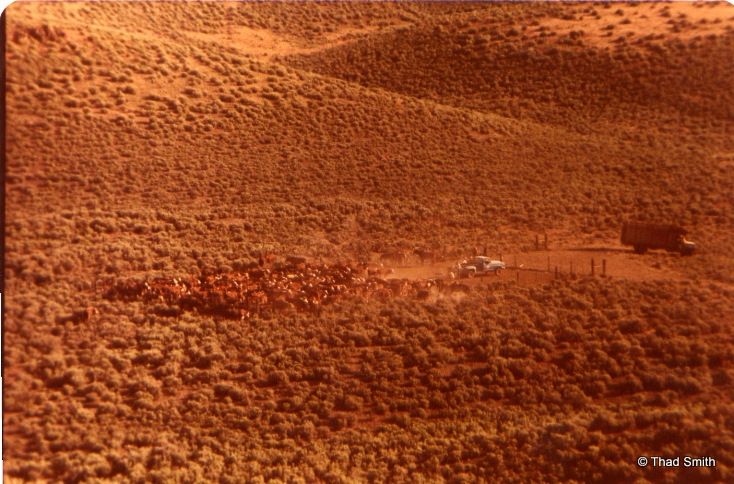 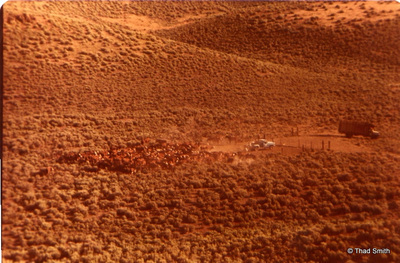 Here is a pic of the brandin crew in 1984..."We branded around 6,000 calves from when the wagon went out around May 1st and was mostly done brandin' by mid July..course for the 4th of July all the buckaroos went to town for 3 or 4 days seein' as how we had no days off in May or June. 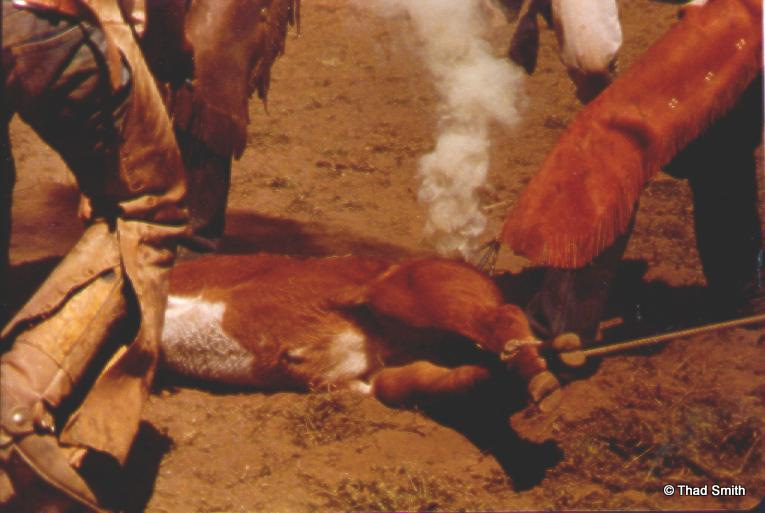 We heeled all the calves by 2 heels ONLY...No calves where brought to the fire without both legs in the rope. 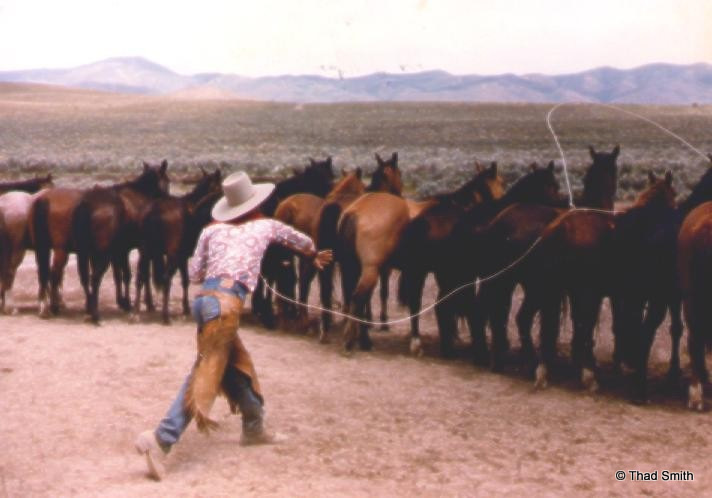 Mostly they came in layin down so as not to have to much trouble muggin' 'em down. The pic of the brandin' crew of 1985 was taken at Brush Creek Brandin' trap. "The wagon was camped at Packers Cabin . Most of the crew had been with me for a few yrs. 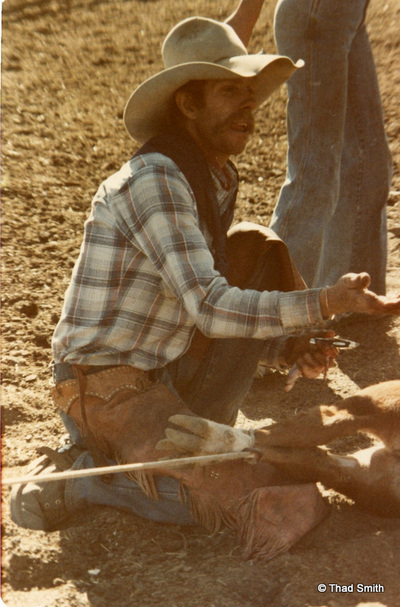 Thad talks about the horses, "this picture where I'm holdin a calf I was on my personal horse (Bart)...He was by far the best of the best in a brandin trap...My dad raised him in California to be a race horse but he didn't make the cut...So I started him and keep him till he died here in Calif at the age of 26 yrs old...Like most of the horses in my string he was a straight up bridle horse...YUP he was a good one...and just so you know...When i was there at the TS we had a 20 head brood mare bunch that run with the stud spring and summer.. we sold ALL the filly colts as yearlings and cut, wormed, branded, and docked the tails of all the stud colts we cut..We kept the colts to start as 3 yrs olds. 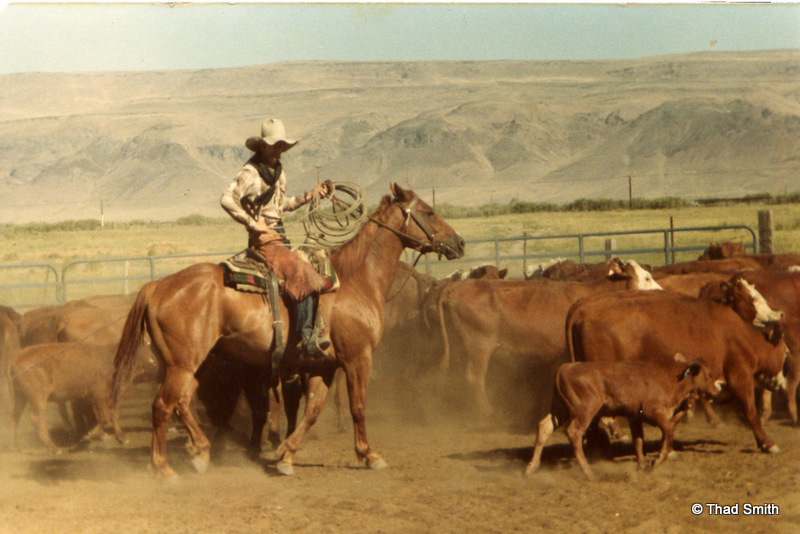 they where mostly started in the summer of their 3rd year..some worked out good and some didn't..."
Thad continues, "I had alot of input to the feedlot...It was built while I was Cowboss..Also the Brahma cross started as i was cowboss..We started with 100 hd of Brahma bulls from Texas. And the red cows where ALL setup by me to improve the herd..A bunch of bigger red cows where brought in from Wyoming..Anyway I read the webpage of the TS and got a chuckle cause it sounds like they keep up what I had setup years ago..course i could not have done it on our own..The ranch manger (Dale Robertson) and Owner (Bob Rebholtz/Agri Beef) where involved in the logistic part of the ranch and cowherd improvement. I could go on and on about all this but will stop short here. 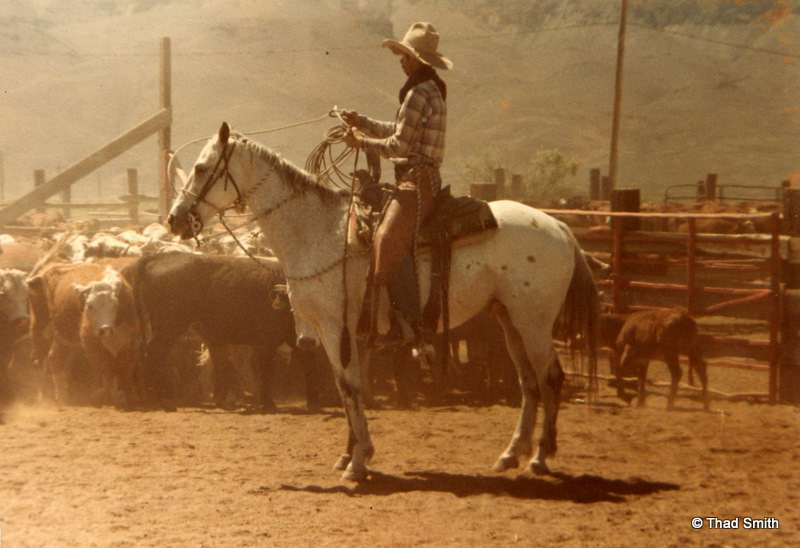 It does make my heart feel good and full knowing that what I did way back then made a good foundation for the way that the ranch is run today."